Delight your tastebuds with the tantalising dishes of Marhaba Restaurant with this set meal. 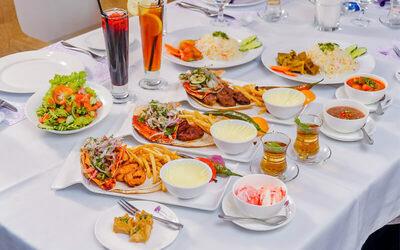 Share this meal with a loved one and enjoy a mandy, along with a shish tawooq, lamb cube, or a shish kebab. Complement your mains with a salad bowl, Arabic tea, drinks, and dessert. Valid Mon – Fri: 11am – 11pm. Valid on public holidays. Not valid on Sat - Sun.